It's absolutely ages since I did a freeware post. And I've been meaning to do this one for, as it happens, absolutely ages. It should be, I hope, highly useful for those who write and comment on blogs and message boards a lot, using basic html or BB code for things like bolding, italicising, quoting and creating links. If you regularly use such code, and especially if you dislike it when you bugger up (Ah, the joys of the missing closing-tag! ), or just plain don't like the way typing formatting-tags slows your typing down, I've got two freeware utilities to help you out. 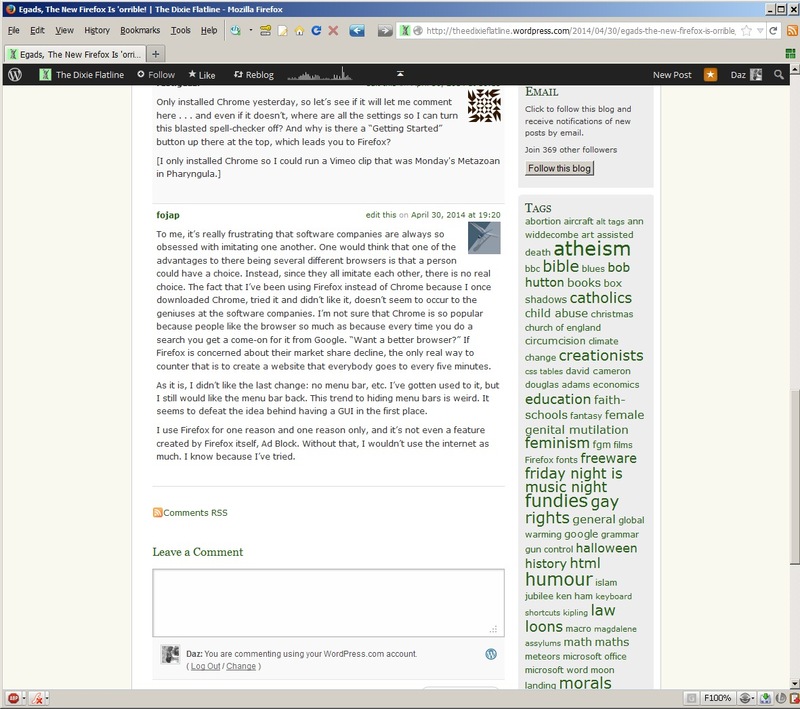 After being constantly annoyed by the way freethought blogs' new layout puts half the content and comments off the right-hand edge of my browser, forcing me to constantly use the much-hated horizontal scroll-bar, I found an easy way to correct it in Firefox. And being a nice sorta chap, I thought I'd share it. A recent post by the Inactive Activist reminded me that I'd planned on a few freeware-related posts, so here's the first of them. A pretty short one to start with. I love RSS, and it was something of a blow when Mozilla removed the RSS icon that used to appear in the address bar (now known, somewhat grandiosely, as the 'Awesome Bar' ) when you visited a site that offered the service. It's part of a trend I've noticed, roughly since they stepped up the frequency of updates and new versions, that they often take the route of telling the user what the user wants, rather than offering a choice to make the customisation. Anyway, this handy addon puts the RSS icon back where you want it, so you don't have to hunt around the page looking for subscription options.